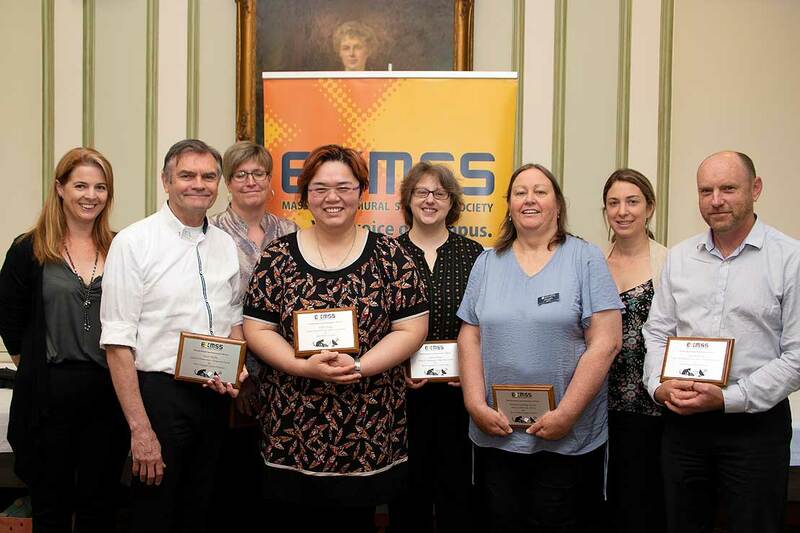 At the inaugural Exy Awards run by the Extra Mural Students' Society (from left): Hayley Brandon (vice-president of EXMSS); Steve Duffin (School of Humanities); Jean Jacoby (Digital Innovation - Sciences); Dr Polly Yeung (School of Social Work); Dr Karen Jillings (School of Humanities); Christine Harris (team leader - Distance Library Service); Hannah Mooney (School of Social Work) and Dr John Battersby (Centre for Defence and Security Studies). Dr Ella Kahu: Ella creates a sense of community and belonging for distance students which counters the isolation sometimes experienced in extramural study. Regular online tutorials which feel inclusive. Newcomers welcomed by name as they join the tutorial and addressed by name in interactive tutorial conversations. Ella promptly replies to student comments in Stream forums, conveys the sense of being available and supportive of distance students, and offers genuinely helpful and practical tips for distance study success. Natural conversational lecture presentation style is engaging - able to deliver a Stream lecture without an autocue or sounding like the material is being read from a page. Content is relevant and well prepared and reminders of learning outcomes to focus on are highlighted.